Originally designed as a Formula Atlantic car, the Chevron B34 was ready late in 1975. By fitting a Novamotor developed Toyota engine in place of where the Hart BDA had previously been, the B34 was turned into a hugely effective F3 machine. Once a young Riccardo Patrese had proven the new Chevron was a winning car, the orders came in thick and fast. Developed by Derek Bennett and Paul Owens, the B34 was built around an aluminium monocoque. It featured a wide track, which made it relatively easy to run. Customers could fit the B34 with a choice of engines but the most competitive of all was the Toyota Celica based four-cylinder engine. Developed by Italain specialist Novamotor, the two-litre unit produced around 170bhp with the mandatory intake restrictor fitted. Patrese raced for the works supported Trivellato team and ended the 1976 season with five victories in the B34. In addition to the successes scored by the Italian racer, Geoff Lees, Rupert Keegan and Fernando Spreafico all won races in the B34. By the end of the year, Chevron had sold and built no fewer than 33 examples of the B34 in both Formula Atlantic and F3 guise. Compared to the March 763, the Chevron the B34 was above all easier to run, particularly in the wet. For 1977, Chevron produced the subtly modified B38, which managed to score 20 victories and was second only to the Ralt RT1. A third evolution, the B43, was readied for 1978. Unlike the B34 it was derived from, the B43 had a reputation for difficult handling and was only successful in Italy. The B43 proved the end of the line for the F3 Chevrons after Derek Bennett's tragic hang gliding accident in March of 1978. 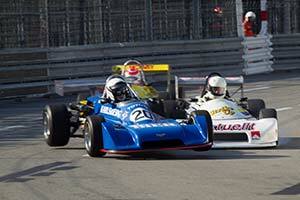 Particularly the B34 and B38 proved hugely competitive, rivalling the best March and Ralt could offer.